The Genaray Torpedo Portable Daylight Focusing LED 3-Light Kit was put together by B&H for image-makers who want to take studio-quality lighting on location safely in sometimes rugged conditions. The kit includes 3 dimmable, AC/DC Torpedo Daylight Focusing LED lights with 4-way barndoors and fan-cooling. For impervious storage and transport, a waterproof, crushproof, hard polymer case is provided. Designed for photographers and videographers who require "big light" performance features in a small, lightweight fixture, the Torpedo Portable Daylight Focusing LED from Genaray weighs 2.6 lb and measures just 8" in length, yet outputs the tungsten equivalent power of a 200-300W Fresnel. True to its name, the light has an expansive focusing range from 15° for sunlight, sharp-shadow, or long-throw work, to a wide 75° flood for fill light or diffusing through a silk. The included 4-way barndoors allow you to further sculpt the beam for selective lighting. The Torpedo employs COB LEDs to draw more power from the tiny array which can be dimmed from 1 to 100%. The versatile Torpedo offers power options thanks to the inclusion of a universal 100 to 240 VAC adapter, but you can also run on NP-F or V-mount batteries when mains power is unavailable. The Torpedo has a tilting yoke with an industry-standard 5/8" receiver for matching light stands. 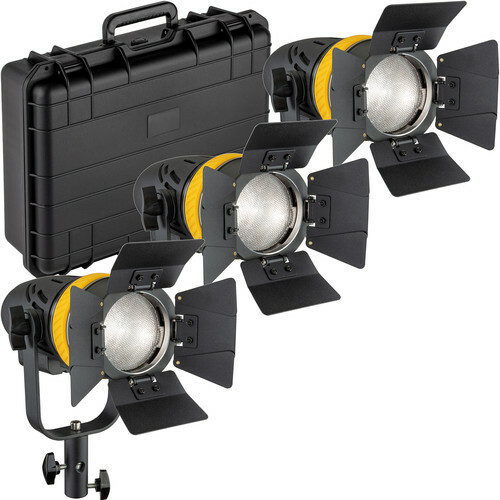 Box Dimensions (LxWxH) 15.45 x 9.5 x 5.85"
Torpedo Portable Daylight Focusing LED 3-Light Kit is rated 4.7 out of 5 by 13. Rated 5 out of 5 by Jeff from The Little Light That Could As content creators, wether it be photography or videography, we can all agree that light is one of if not the most important part of the “recipe”. We will spend countless thousands of dollars on lighting gear to be able to craft our ideal image. Part of that secret sauce is subtlety and nuance. Sometimes the biggest light in the room isn’t the one that gives the most impact. That’s why I love the Torpedo. It’s a powerhouse LED fresnel style light in a tiny package. I’ve been using this light for various shoots for the past few weeks and it still impresses me. A lot of thought went into this. Beyond the fact that it is a fresnel style light (it uses plastic instead of glass) allowing you to angle the beam of light from 15 degrees all the way up to 75 degrees, it’s the little things that makes me know this was designed by people who know what an image creator needs. Everything from the unobtrusive LCD display to the rubberized grip on the focus ring lets me know that this was made for “us” by “us”. And the fact that you can get an optional Bowens mount for it is clutch. I’m not going to get into the technical specs of what it’s capable of (because honestly just like sports, the stats bore me.) but what I can say is that this thing is super bright and I’m impressed by how clean the light looks. You aren’t able to dial in the color temp (it outputs at 5600k), but that’s really a non issue for me. I was able to get 5 hours at 100% power off of one battery (Anton Bauer NP-F976) which was incredible. The only thing I noticed was that the charge indicator on the LCD never displayed the actual battery power. It always looked as if it were starting at 50% despite the fact that I knew it was a fully charged battery. This could simply be a firmware issue. My only real issue with the light isn’t a deal breaker for me. When you insert the included gels into the unit, there is a little bit of spill on the edges. It isn’t noticeable on camera or on the footage, but I’m nit picky about that kind of thing. All in all this is a lovely little light that gives you the ability to truly craft the imagines you see in your head. Rated 3 out of 5 by taylor from Not the all-in-one light I was hoping for. There weren’t many internet reviews on the torpedo. From the BandH reviews it seemed like a no brainer to buy. But I can’t recommend this light. I wanted to use it at weddings or as a key/fill light for interviews. At weddings I need a battery operated light but with a fully charged npf970 the light only stays at 100% brightness for half an hour. This is very frustrating. At the end of 30 minutes it goes to to 50%, which does very little to light a subject from a distance. My Neewer LED panel is just as bright but the only difference is that the torpedo is focusable. I would love to see a comparison with the boltzen 55w. But as of now I would say to just just bite the bullet and buy the 120d. Build quality is also questionable but I have yet to use it on a paid job so we will have to wait and see how it holds up. Rated 5 out of 5 by Michael from Excellent and Versatile Texturing or Hair Light If you ask me, for almost all scenarios, this is one of the only lights you would ever need aside from a strong Key light. I used this on a shoot last week and we shocked at how far back I could take the light out of frame and still have a relatively soft beam to highlight my subjects profile. The strength of the light is astounding. I was honestly surprised. This thing could be used in so many different instances. The focus ring really helps dial in the intensity as well. Setup was a breeze. I unzipped the case and had the light up and running within 2minutes. I used to use Genarays Contender series but this trumps that unit by far. In rare cases I could see this being used as a key light if you put the right modifiers in front of it. The only thing I noticed was that you have to long press on the buttons for things to really happen, but thats a minor gripe. FIVE STARS. Worth every penny. Rated 4 out of 5 by Itan from Good light, awesome B&H service The light itself is decent and does what its supposed to do. However, here Id like to thank B&H. My light came with a slight defect on the barndoors; also, one of the gels was definitely used (there were scratches). I contacted B&H and asked if its possible to replace the barndoors and the gel. They replied almost instantly, apologized, and arranged a package with a new set of barndoors and a gel immediately - I received it a few days after receiving the light. Wonderful service, Im very pleased and I will definitely order again! Rated 5 out of 5 by Walter from Darn Nice This is a darn nice little light as a separation light, hair light, or background light used by mixing it with other LED lights for a small product or single person portrait shot. Very compact, lightweight, and portable. Barn doors are well made, not flimsy. The supplied carrying case is not padded, but it is well made and correctly proportioned. Its not going to substitute for strobes or more powerful lights for whole room lighting, but does exactly what I intended when I purchased it. Rated 5 out of 5 by Philip from Nice light very portable These lights are a big improvement from the last model. They dont make any noticeable noise you can use them when shooting audio they accept a standard NP sony battery and have a clear readout. Rated 5 out of 5 by Thomas from Very Happy My first Fresnel, and I am very impressed with brightness, compact size, and versatility. Also nice solid feeling build with enough metal to be sturdy, but enough plastic to be light weight and portable. Ive used it for in-studio video, and it is very bright and also quiet enough to use with live mics. Not silent but very quiet fan. Considering that many fresnels cost over $1,000 this is an amazing deal. Rated 5 out of 5 by James from My first focusing light I have a wide range of LED Flat panel lights, so this was my first focusing light, and I have to say that I am very impressed with this light, the quality and strength of the light, the build, and portability. I record interviews and educational content and have preferred the flat look, but this light brings a new, easy to design lighting component. I may buy another. Is this strong enough light to bounce into an umbrella and use for daylight portraits? While this light is strong enough to bounce into an umbrella, you would need an additional adapter such as the Impact Swivel Umbrella Adapter B&amp;H # IMCA108. However, the light would not be centered in the umbrella at that point. What's the difference between this Led light and the ones with an array of leds on a panel? This is a single point LED which is focusable. Which soft boxes will fit the opening of this light? Is there an adapter to match common brand softboxes? If you purchase the Genaray Bowens Adapter for Torpedo Focusing Spot LED, B&amp;H # GEBLT60BA, you may use any softbox that has a Bowens S-mount speedring on the Genaray Torpedo Portable Daylight Focusing LED, B&amp;H # GEBLT60. The fan is definitely noticeable in a quiet room when the light is running hot at full power. I was disappointed about this. However, the fan only kicks in at about 50% brightness, and then gradually increases rpm and noise as the light's brightness is increased. What would be the maximum distance 'throw' of this light at the 15 degree setting? Would it be strong enough for example, to increase illumination somewhat on a subject about 50 feet away (e.g. for a conference)? No! These lights are not very bright. They work great when shooting small tabletop products but would not do anything from 50&quot;. More like 5' effective distance. Yes, will slip onto a light stand top. ?&quot; stud is simply larger. Does this include ability to control by wifi? Is there an optional dongle to plug into the back of the unit? Does it have it's own remote or can we control by iOS or Android? Can you provide a link to the options?